Are your clients dealing with some form of clutter (physical, mental, emotional)? Would a fun visual aid help them declutter their homes, offices and lives? Want to give your marketing prospects something different, useful, and cost-effective to remember you by? 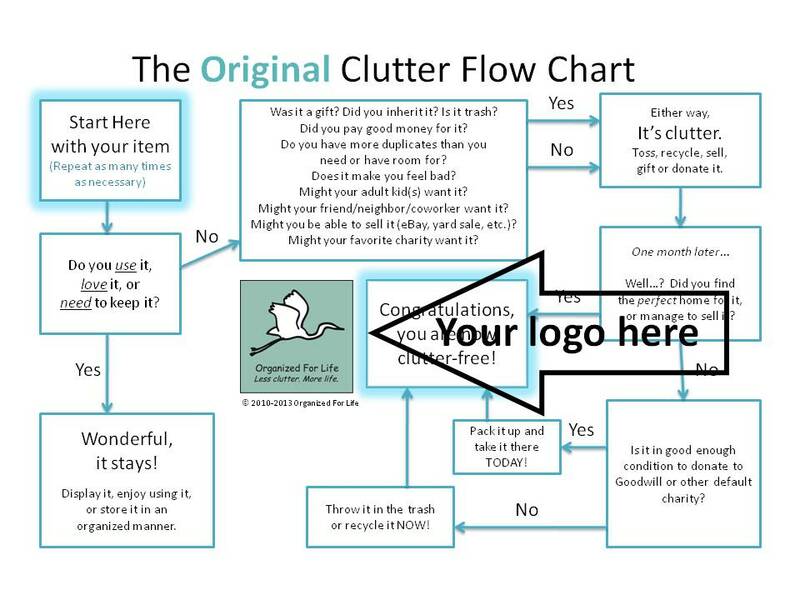 Why not try Custom-Branded Clutter Flow Charts? …to help YOUR business grow! Ready to order? If not, scroll down to learn more! All charts come with a Companion Article, Limited Distribution Rights, printing instructions, and suggestions for use. Contact me directly for additional discounts on multiple 3-Packs! I created the Clutter Flow Chart Collection to help my organizing clients continue the decluttering process when I’m not right there by their sides. Then I realized they could help YOUR clients too! These charts are handy tools that double as great marketing pieces for my business…and for YOUR business too! What types of professionals use Clutter Flow Charts? How can these charts help YOUR business grow? Which flow charts do THEY need? and want to HIRE you? This chart will help you decide where to start! People do business with people they know, like, and trust. What better way to establish your expertise and generosity than by giving your clients and prospects a marketing piece that will also help them clear the clutter from their homes, offices, schedules and lives? Trust me, these charts will not replace the need for your services! They will simply provide a bit of instruction, encouragement, and humor. Sure beats a pen or a mug, don’t you think? Here are some of the MANY WAYS these charts can be used to help YOUR business grow! Laminate for use as a gift (durable, wipes clean, less easily lost in a pile, can be 3-hole punched for binder storage). Print the chart (front), and companion article (back), on card stock. Print the chart and companion article on regular paper and store them back-to-back in a transparent plastic sleeve. Be creative…and let me know what you come up with! Ready to order? If not, continue scrolling! Want more? Ask for additional discounts on multiple 3-Packs! 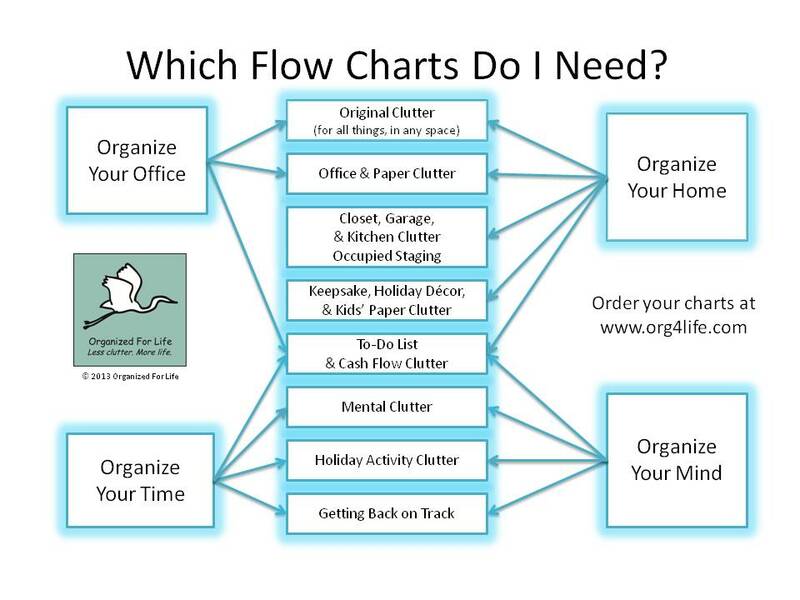 For more information, take a look at this short video, Why Clutter Flow Charts? Q: What do you mean by “custom-branded” charts? A: I will replace my logo with yours on the charts, and I will replace my logo and contact info with yours on the companion articles. I will also use your custom colors. Please be aware that the chart content, layout, and article content are not available for customization at the stated price. Q: What will I get for $60? Q: Tell me more about the articles that come with the charts. A: Each chart comes with a different theme-specific companion article that helps you answer the following questions: Is it clutter? Why can’t I part with my clutter? What should I do about my clutter? What if, despite my best intentions, I am still living with clutter? Q: What are Limited Distribution Rights? A: Click here to view the Limited Distribution Rights Agreement 2018. Q: How do I get my logo and contact info to you? A: In most cases I can search for your website and find everything I need there. I will let you know if I need additional information. Generally speaking, though, compact logos in .jpg format work best (see my egret logo as an example). Q: What if I don’t have a logo or a website? A: That’s OK. I can add your contact info to the chart and article in an attractive manner. Q: Can I see samples of the flow charts? A: Absolutely! Just click here to view samples of ALL the charts and ALL the companion articles! Q: How do I stay up to date with new charts, uses, and offers? A: Subscribe to Clutter Flow Chart News. 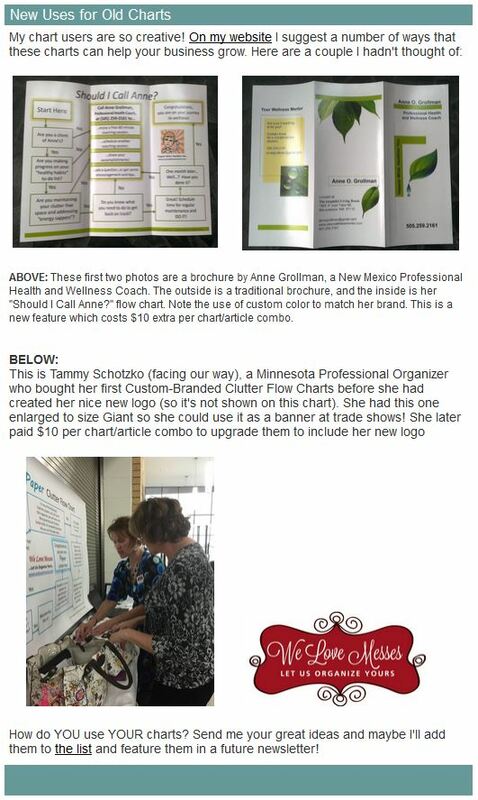 You will also get a complimentary copy of The ORIGINAL Clutter Flow Chart Go With the Flow! module, an 11 page PDF). Just click here. A: Please allow 48 hours for customizing and sending the PDF files to your email inbox. Q: OK, I’m sold! How do I order?